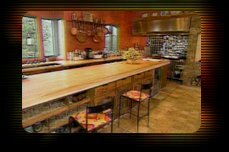 Chef Mark Miller of Coyote Café fame, has an incredible house set on 20+ acres outside Santa Fe. His pride and joy is the kitchen he designed specifically for this setting. This 10-hour day was all shot hand-held. Dale had his work cut out for him - so you might say he deserved the buffalo rib-eye roast that Chef Miller was generous enough to send home with us.